I had wondered how this new X-Men "reboot" would play out because of the previous X-Men trilogy. Surely we would see no surprises from a prequel. I will admit, X-Men first class was a breath of fresh air. It was surprisingly good, although the outcome, again, not surprising. How is Days of Future Past Possible?! 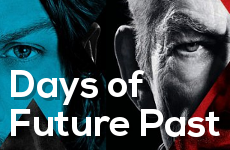 Now we have X-Men: Days of Future Past. How can we find story where there is none? We already know everything that happened. I mean First Class was so good, we want three of those! How do they make another movie without ignoring or modifying the already establish trilogy? The answer is obviously time travel. As Twentieth Century Fox describes it, "the characters from the original X-Men film trilogy join forces with their younger selves from X-Men: First Class." Just watch the trailer. Oh mah gahd, they're starring at each other! Shouldn't the entire universe be imploding or something? We're gonna see characters from all X-Men movies and I for one can not wait to see more of Halle Berry, it's gonna be great. According to IMDb, this movie has 23 May 2014 US release date. The movie has a budget of over 250 million dollars. Filming was completely finished back in August and it's not due for release till next year, this to me means we're gonna be getting some really awesome special effects. Visit IMDb for some frequently asked questions: FAQ for X-Men: Days of Future Past. Do note there may be spoilers.